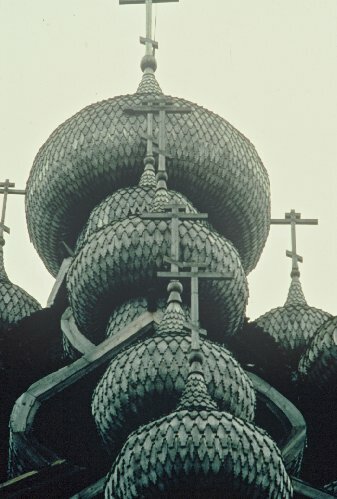 Closeup of the wooden domes of the Church of Transfiguration at Kizhi. Roll mouse over photo to see one of the houses (now a museum) on the island. KIZHI is an island in Lake Onega, one of Europe's largest lakes (second only to Lake Ladoga, also in Russia.) This lake is located in northwestern Russia, in the autonomous region of Karelia. 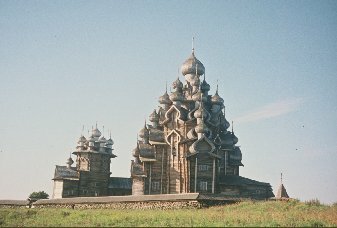 Kizhi hosts a wooden architectural museum, containing many old and beautiful wooden buildings with a northern European heritage, notably Finnish. The most beautiful of the buildings is the main "summer" church of the Transfiguration. It is entirely built by hand, using wooden pegs instead of nails. The domes are covered with silvered wooden curved shakes. The church is huge, and dwarfs visitors when standing by it. Some of the buildings on this small island have been brought from other locations to make the museum display more complete. I've journeyed here three times and hope I will be able to return! This is a magical place. Below, you can see the main church. A person would not be as tall as the wall in front. Click button to play or stop Balalaika Music- Evening Bells (Vecherniy Zvon): with permission from the artist Barynya.